Kinda. Advanced programming techniques like neural nets and evolutionary programming are allowing engineers to build systems that address ever large problem spaces. They just don't know what their programming is going to produce. It's just like a parent who tells their child one thing, but the child interprets that statement in an unexpected way and goes off and does something hilarious. Or dangerous. That's where robots are going; we want them to tackle huge problem spaces, but we don't know if our programming is going to produce what we thought we wanted - or something else entirely. Yes, everything remains deterministic, but the point here is that our programming techniques are making our creations less predictable. Perhaps it can be said that any sufficiently unpredictable system of logic is indistinguishable from intelligence. Which is why we consider ourselves so advanced. oop, okay, i am going to try to explain this in more depth. i will condense my explanation as best as possible and under the pretense assume i need to explain quite a bit (just for thoroughness purposes). some context: how learning algorithms work. conclusively, there are two different types of A.I: the deterministic model that mimics intelligence and learning behavior but actually has no “consciousness” or awareness of any kind. an example: NPCs in a game or Siri. this is the type of A.I that we have now and will have for the next 10 – 20 years or so. then, there is the Sci-Fi type of A.I, the machine that literally thinks in a human manner, has emotions, has feelings, etc. that is the thing that we would not be able to control. but how does it do that exactly? presently, and agreeably, A.I isn't programmed like that, as much as it is trained from datasets and cause and effect associations. if a particular dataset or training set was learned by an A.I with A.I and it developed emotions, we would know how to enforce certain limits on its ability to think of us as “bad” or do something that would hurt humanity as a whole. so we can control its access and ability of movement to prevent it triggering a terminator-eque apocalypse if we have gotten to the point where we have developed a training dataset that contains the ability to develop emotional consciences. as it is, "emotions" are just a mapping for certain situations given certain mental states that lead to making a bad or good decisions (our wiring is the same way -- we have synapses and connections that make these connections of our own nurtured parameters). a bunch of people not involved in A.I. have just said a bunch of fear mongering nonsense that people take at face value because of their status (Musk, Hawking). it's because of this bad journalism and media that people are assuming concepts like self-awareness and are making the assumptions that an AI would think like a human (I.E: your child running around example), or that it would want to be in “control” or that it would develop a “hate” for people or that it would have any desires at all in the first place. A.I has developed a stigma that it will be as malicious or malignant as humans, but the truth is that it is not even close to being developed yet, so we know nothing really. hollywood does an excellent job blowing things out of porpotion, as some of their own space movies can't get accurate depictions of physics correctly. Interesting to hear it from someone actually working with AI, thanks. a bunch of people not involved in A.I. have just said a bunch of fear mongering nonsense that people take at face value because of their status (Musk, Hawking). Unfortunately, that's neither going away nor is limited to AI. That said, we are the people who nearly nuked ourselves to oblivion because some guy forgot to switch a computer from "Exercise" to "Real". So if we can screw up something as simple a process as that, with literally everything hanging into the balance, it is to be expected that people will be wary of more complex systems. The problem is, fearing a spontaneous self-aware Skynet that decides that it wants to wipe Humankind out isn't going to help if the real danger is a non-self-aware Skynet that happens to not switch between "Exercise" to "Real" because that one little detail escaped scrutiny until the thing was plugged on the actual nukes. I'm sure all those very smart men are just doddering relics of a past age and that it's not that you just misunderstood their letter. They're talking about the dangers inherent in creating machines that are coded to make decisions. Most immediately, what do we do when a self-driving car is faced with a disaster situation where it's going to hit pedestrians? Does it just turn off and disavow any responsibility? Does it plow into the oldest people? The ones who look like they'll bounce off best? Somebody is going to be hit, and the machine has to be able to make a decision. Their letter is saying that when people are building AI into stuff, they're going to have to be dealing with those sorts of things. So ultimately, the point is that machines are going to be making decisions for us. We have to tread carefully. The cautionary tale here is the internet. We didn't have an open letter about its dangers. We didn't tread carefully. So now we have a real mess on our hands. The internet is all about moving information yet we have laughably-bad controls for doing so. If decision-making in AI is as bad as information management in the internet, we'd have a complete nightmare on our hands. Down the road, the law of unintended consequences might well kill us all. Complex systems get messy because after a while nobody understands the entire beast. That's an appeal to authority fallacy, you know. Those people are also capable of spewing utter nonsense that would be hilarious if their twitter followers numbers had a few less zeroes, when talking out of their field of expertise. That's an appeal to authority fallacy, you know. I thought it was an appeal to common sense. When a dozen or so people who are known to be both highly intelligent and highly accomplished agree on something, I'm far more inclined to accept what they have to say than when one random guy on an obscure internet forum says something else. Color me brainwashed, I guess. I don't trust the A.I. As little things like crosswalk buttons have problems. If simple things like that can have difficulty then why would I trust complicated things? Something programmed badly is the same thing as the device malfunctioning on it's own regardless of the fault. Like off the coast of Iran when an American ship was doing war things and an Iranian passenger plain got close enough for the automatic defense systems of the ship to shoot it down. Can't think of everything. Not brainwashed, but certainly mistaken: intelligence is useful in general, but counter-intuitively, being great in one field doesn't necessarily translate in others. Assuming that Kindred did work with AI to some extent (and I see no reason to doubt it so far), then yes, I would trust the random guy on an obscure internet forum with actual AI experience than the world-famous people without it, particularly when some have already Dunning-Kruger their ways so hard into other fields that even high school students will facepalm. Even the most brilliant people in one field can be utterly lost in another. And making a common mistake is still a mistake, even if it is common. Do you remember the Malthusian Catastrophe we were forewarned by so many? How by the 2000s, there woudn't be enough food for everyone? This included brilliant futurist and, more memorably, SF writers (The Forever War, Stand on Zanzibar, Soylent Green...) Demography specialists all said there wasn't really a danger, that demographic transition would end up stopping the exponential population growth. But who care about them? All those brilliant (non-specialist) people told us how the Malthusian Catastrophe was approaching! This is not to say that specialists can't be wrong, individually or (rarely) even collectively, sometimes with catastrophic results, but it's still a good rule of thumb to listen to people who actually know the field, in general. There are examples of AIs going stupid and shooting what they shouldn't (IIRC, there was even one instance where, during a demonstration, an AA system glitched and shot right in the tribune), but this one was a human error, not an automated one. My "brainwashed" comment was self-effacing humor. I have no notion of being confused here. READ the letter and LOOK at the endorsements. There's also a 'research priorities document' associated with the letter. For those who don't follow links, the open letter pretty much just says "be careful with AI". The endorsements include AI researchers, authors of standard AI books, and a bunch of people like the VP of Cognitive Computing at IBM Research, the head of Facebook's AI lab, etc. Stuff like that. At last count, over 1000 people had signed the letter. And even if they hadn't all signed the thing, I'd still take Gates, Hawking and Musk over Kindred's opinion because it's not about the mechanics of the technology. Anyone with a technical or scientific background can understand AI. Those guys certainly qualify. As a long time software engineer, I understand it tolerably well. But they also understand the macro view far better than Kindred. They know what happens when the world industrial complex gets its hands on a new technology. Kindred does not. At the bigger scale, it's about the unintended consequences. But to be completely honest, Gates, Musk and company probably signed the letter primarily to generate some media interest in it. It's like showing up at a fundraiser so that the fundraiser gets some attention. The fact that so many publicly-visible and accomplished figures from the world of science and technology piled on tells me that there's some sincere interest. Here's a quote from the research priorities document's Control section. I picked Omohundro at random from the list of authors. Here's his Wikipedia page. "He argues that rational systems exhibit problematic natural "drives" that will need to be countered in order to build intelligent systems safely." And I'll stop there. If you disagree, that's your prerogative. "but this one was a human error, not an automated one." Like I said it doesn't make a real difference. All mistakes an AI makes can be pined on a human. Well, those people indeed are specialists in the field, so yes, I will take their words very seriously. My point was specifically about giving the same credit to Musk or Hawking. Their word, there, have not much weight than, say, would John le Carré or Chris Hadfield - sure I'd pay attention, but wait for actual experts before any decision. Even less so in the case of Hawking, who already prove woefully incompetent in another field. Not quite, and that's an important point, actually. When it is a human error, the humans can me kept accountable, and they can even face the judicial system in the worst cases. When an AI makes a mistake, the responsibility is diluted. Is it the sub-contractor team that developed the algorithm that is responsible? Or is it the one, from another sub-contractor, that fine-tuned it through AI learning? Or is it the one that designed its architecture? Or the ones made tests? Or the one that ordered its deployment in those conditions? And this isn't simply a blame game. Without accountability, people may simply not feel responsible from the end-result, and let things go that an accountable human (in principle) can't. For example, when people are killed because one commander ordered to fire at innocent civilians, he can be held accountable, and others commanders will make extra sure that they won't fire at innocent civilians, not only to avoid sanction but also to not have those dead innocents on their conscience, for which they would clearly be responsible for. If it is an AI glitch that fire at innocent civilians, each individual that worked on the AI may say "well, I wasn't really responsible anyway", and not feel like they should put extra more efforts in the thing to make sure it doesn't happen again. After all, that one glitch was fixed ("they did fix it, right?) and it's not really "my" role anyway. The accountability problem is a big one (it is the reason most nations are against letting killer drones without a human in the loop to push the button, for example), and one without obvious answers. Which makes for great fodder for those who want to write SF! My point was specifically about giving the same credit to Musk or Hawking. Yup. If it had been Musk saying that, I'd have thought "Okay, rich guy being paranoid or a busybody or whatever". OR, if Hawking had said it, I'd have thought something similar about really smart people. But when Gates, Hawking, Musk AND Wozniak all say the same thing, I sit up and take notice. And I agree with your comments on responsibility. It is a serious problem that permeates our society. With so many people involved in the processes that keep our society operating, it's difficult to assert who did what to whom. We say that companies and corporations did this or that, but it is always people who do the dirty deed. When an AI makes a mistake, the responsibility is diluted. Is it the sub-contractor team that developed the algorithm that is responsible? Not the point. Regardless of ducking responsibility, a human is still responsible. I just want to pitch in and comment that although we've made really cool advances in AI recently we are still a LOOOONG way from the type of general problem solving AI that would give justification to the fears being expressed by many experts outside the field of AI research. Algorithms like Deepmind are great for pattern recognition and deciding the best output for a certain set of inputs. But they are a long way from being intelligent. The best way to evaluate the progress for simulated intelligence is to try chatting with a state of the art chat bot. That's how far we are away from a real general AI. Our best bet at a real general problem solving AI in the short to mid term is by recreating the neural layout of very simple creatures such as fruit flies. There's big technical hurdles to doing that and at the end you have something as intelligent as a fruit fly. Scaling that up to anywhere near human intelligence would still be a mammoth task and require many more years of Moore's law before we had the required processing power. The other possibility is that a solo genius develops a new algorithm for general problem solving. Combined with algorithms like Deepmind this could then be a shortcut to human equivalent AI that doesn't need us to simulate a human brain. That's probably the kind of scenario that worries people like Elon Musk, It's quite long odds that someone will invent such an algorithm in the near future even if one were actually possible. AI researchers have been looking for such an algorithm since we have had computers (eg. Turing) and we don't seem to be getting any closer. Even with the right algorithm, our software would begin at sub-human levels of intelligence. They would probably begin as AI assistants on our phone that were actually useful, but still be limited to certain levels of complexity and understanding. It's only when we have this sort of general problem solving AI that we need to start considering how to deal with the potential threat of superintelligent AIs. Nobody is going to make a superintelligent AI overnight. It will start as impressively smart, then become genuinely useful, then a peer (with limitations equal to our own) and finally and after very many years, if we are lucky, it will become our guide. If you see how the best AI robots see our world, your know its rubbish, how could anything learn anything more than basic shape outline from blocky and other radar like imaging. Until they see nearly like as we do, then AI brains will start to understand the world around them on there own. To know what a cup or mug is and to know its surface and painted pattern to recognise a picture etc on the cup or mug and to tell the difference and how to use a tea cup or mug. The human like robot body will arrive long before the AI brain does. I think, before AI gets to that level of learning and understanding, there is a long road ahead. Most if not all reading this forum will not see this time. An AI that semi-runs a manned Mars mission is possible I think by 2030's, maybe to talk to on a technical level by the crew, yes I think that might be a possibility. How much it would know outside of the ships commands and emergency procedures is anyone's guess. But I'm sure it will not be relied upon totally. right now 2030 seems a long way off so who knows how advanced space craft AI will be by then. I'm sure there are NASA teams considering this right now. A new simulation of how Pluto got its "heart" suggests that the dwarf planet most likely has a deep ocean beneath its surface. Scientists have long suspected that Pluto has liquid water hidden underground. When NASA's New Horizons mission first set sail to the outskirts of the solar system, scientists were already planning to investigate whether the dwarf planet harbors water. When New Horizons flew past Pluto in July 2015 and beamed its observations back to Earth, scientists found evidence suggesting that Pluto had water at some point. 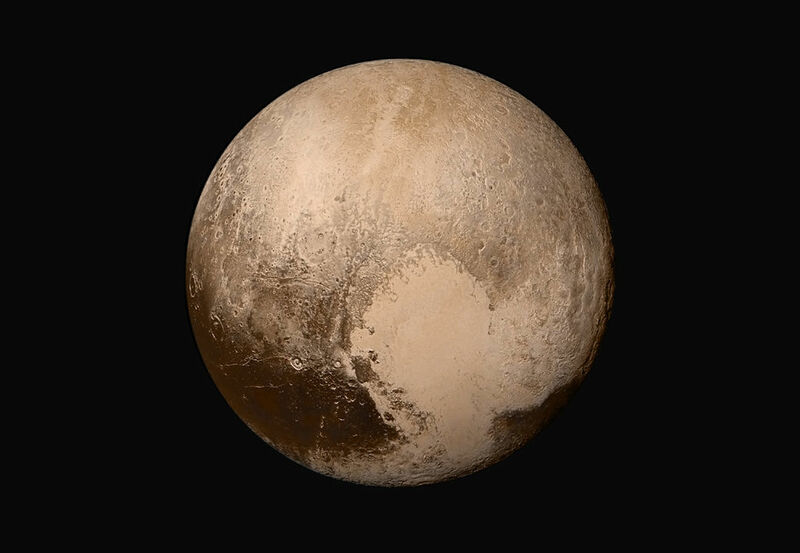 However, they weren't sure whether Pluto's had an existing ocean, or if it had frozen solid over time. Pluto's heart holds clues about an underwater ocean on the dwarf planet. I'm not a physics major, let alone claiming expertise in quantum physics, but the results presented in this seemed to have results aligned with the time-symmetric interpretation of quantum mechanics. If I understand it correctly, according to TSQM the particle already "knows" about its future interactions to the extent that quantum information is preserved through any intervening interactions. An example of this being that a photon-splitting, the photons leave their source with polarizations that are aligned with (or opposite) the axis on which they will be measured. In effect you could assume information "propagates" in both temporal directions, or summed up succinctly: the particle's entire timeline as a single entity. Citing papers from TSQM, the speculation is that it may, or made, no predictions that are different from the Copenhagen interpretation. The experiment discussed was the first to show a difference. This difference was not of any predictions, but the additional mental contortions required to hang on to the Copenhagen interpretation. As far as we understand physics, there's still no ability to send "real" information faster than light or backward in time. Or it could be impossible. I say this only because of the purported equivalence between TSQM and Copenhagen. Intuitively, it seems like it could be related to the (quantum) information-theoretic version of entropy that you get with reversible computations. Or maybe even just real entropy, since TSQM still "behaves" as if it's nondeterministic from our perspective, since we can never know enough about a system to know its "true" internal state. So somehow everything conspires to prevent us from setting up a system that would carry some piece of information back in time that we care about. Another perspective could be that the universe is a solution to some kind of differential equation. Possible solutions that contain paradoxes aren't valid, so they don't happen. Not via some shift in some "unified" timeline, but through colossal numbers of tiny shifts that disperse any information that we're trying to send back in time that would cause any kind of paradox at any scale. The result is a universe that appears to have an arrow of time at any scale we can actually measure, appears to mostly follow General Relativity, etc. Until you get to scales, large and small, where the exact underlying geometry starts to matter. Then to further speculate: paradoxes are what's important, the ability to send information back in your own timeline (i.e. within your own past light cone) is all that matters. If there is no privileged reference frame, this also means you can't send information into spacelike regions of your own light cone, because if two entities do that then you can arrange things to send information into your own past light cone. But if there IS a privileged reference frame, say, the reference frame of the CMB, where you can't send information into its past light cone, then you can send information faster than light but still not into your own past. Recall that the Lorentz transformations were initially introduced to (successfully) explain how light could appear to always be moving the same speed even with a luminiferous ether, but then Einstein discarded the luminiferous ether because he realized it wasn't necessary, not because there was any evidence that contradicted it. I may well be misinterpreting what TSQM.